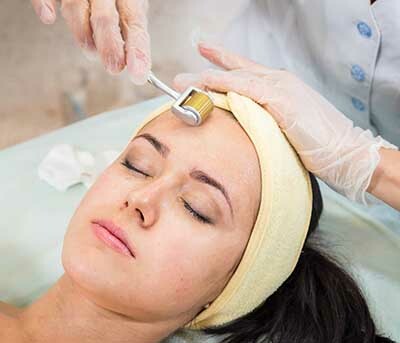 Dermaroller treatment is an innovative new procedure that stimulates collagen production deep in the dermis giving younger looking, fresher skin. The roller is covered in tiny, microscopic needles that are gently rolled over the skin’s surface. These needles encourage regeneration of collagen cells and increase blood flow and therefore oxygen and rejuvenation. The treatment is suitable for all skin types except those who are experiencing an active acne outbreak. People of all ages can achieve benefits from the dermaroller treatment. Your specific needs can be discussed in full with your aesthetic specialist prior to treatment. Clients can expect fresher, younger looking skin with particular improvement to scars, enlarged pores, fine lines and wrinkles and an improved skin texture. Read some of the Patient Stories and find out how happy our patients are with their results. The treatment is ideal for skin on the face and décolletage that is showing signs of ageing, skin damage or acne scarring. Dermaroller can also significantly improve the appearance of ageing hands. After the application of a local anaesthetic gel, the roller is applied to your skin. The procedure normally takes around 30 minutes. We have been successfully referring patients to top Cosmetic surgeons for over a decade. They have decades of experience and proven track record of best practice standards in the field of cosmetic surgery. Following the treatment, your skin will appear flushed, similar to a mild sunburn, however this will subside over the following days. We normally recommend a minimum of 3 sessions spaced 4 weeks apart. For the best long term results, we advise ongoing top up treatments either at home or at one of Nu’s clinics as you require. Why chose Nu Cosmetic Clinic for non-surgical treatments? Nu Cosmetic Clinic has more than 25 years of clinical experience and thousands of happy customers. The Clinics we refer you to are situated in Belfast, Birmingham, Bolton, Manchester, Newcastle, Nottingham, Liverpool, London, Leeds, Leamington Spa, Leicester, Preston and Sheffield. Award winning, stylish and state-of-the-art, the clinics and private hospitals we refer you to are home to the very best staff and technology. There are no before-after pictures currently. The procedure normally takes 30 minutes. This is dependent on the reason for the dermaroller. For scars and acne marks, the effects of dermaroller are permanent. When the procedure is used for skin rejuvenation, the effects last up to 2 years. The procedure can be uncomfortable, so local anaesthetic gel is normally used in the area. This is dependent on the condition of your skin and the area to be treated. Most clients find that 2-4 treatments are sufficient. You can go back to normal activities the same day. Though we recommend you avoid excessive heat for about two weeks after (e.g. sunbathing, sunbeds, saunas). There will be some reddening in the area for a few days, so you may want to consider this if you are planning trips away or special days. Other procedures may be of benefit depending on the effect you are trying to achieve. Your non-surgical practitioner and coordinator will guide you as to the best treatments for you. Yes, many clients choose to have other procedures at the same time. Nu Cosmetic Clinic offers referrals to a range of locations across the UK.. There are no patient stories for Dermaroller Treatment. Any form of cosmetic enhancement is very personal, so prices are bespoke dependent on your individual needs. As a rough guide, you can expect to pay from £80 onwards.